It started with a comic. The character’s name was Shiffley and was the definition of obnoxious cars salesman. Although this character has nothing to do with music, his name and brand is the reasoning behind why a bunch of guys from Long Island decided to play in a band together. So what happens when you mix these guys whose resumes include classically trained musicians, drummers/managers and finance and advertising students? A band with a business plan, that’s what. “Normally when you have a band, what they really get excited about is the music-making part of it but with us it’s honestly more so everyone is collectively more excited about the business side of it,” said vocalist Alex Ganes. By having an entrepreneurial outlook, seeing the band as a business is going to play a large impact on their full length album that is due out in 2017. Shiffley’s two EPs, Atomic Robot Man and Anthem City, were polar opposites as far as studio time. From those EPs came learning experiences, and from those trials and errors the band collectively feels like they have the right studio tactic for a full length release. “With a first album, you have all the time in the world to prepare for it. You can spend four or five years writing songs and some of these are that old. This is fun because some of these songs that I’ve been working on forever - we get to bring them into the studio and make them breathe. We’ve been playing a lot of them for years but at the same time we’re not afraid to make a last minute decision to flip the whole thing on its head… This album is [going to be] a healthy combination of having the hours and also being spontaneous,” said Ganes. 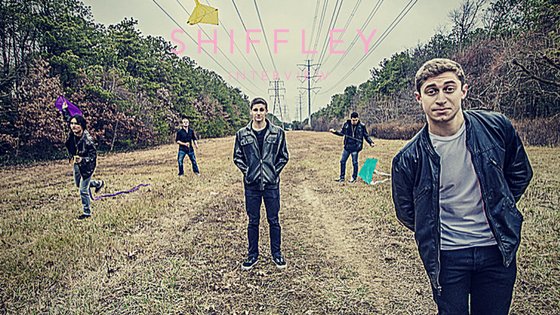 The guys that make up Shiffley had been playing in different capacities for a while before deciding to join forces in college. They tried out different genres before finding their niche, and the first time they performed as a five-piece was when everything seemed to click. In addition to balancing each other out on stage, collectively they put on one of the most innovative live shows. A guy in a robot suit, a confetti gun, foot-operated lights and a bubble machine have all made appearances on a Shiffley stage. “We have a lot of tricks up our sleeves,” said Ganes. As their sound and live performances are evolving, so is their musical ability. They each have substantial understanding for one another and their composition – and that brings their music and brand to life.